The Red Devils have turned around their fortunes since Jose Mourinho was sacked. Jesse Lingard wants to put on a show at Tottenham as Ole Gunnar Solskjaer’s Manchester United look to continue their excellent recent form. Last month’s decision to sack Jose Mourinho has brought an immediate turnaround in fortunes, style and backroom contentment. Caretaker manager Solskjaer has emulated Sir Matt Busby’s five-match winning start to life at the helm in all competitions, although the level of opponent has yet to provide the 1999 treble hero with a genuine test. Sunday’s Wembley clash with Tottenham is sure to be their toughest match to date, but Lingard expressed the confidence around the United squad after bonding further on a warm-weather training camp in Dubai. “It’s going to be tough but, with the run we’ve been on at the moment and the form we’ve had, we back ourselves 100 per cent,” Lingard said. It is also a chance for United to exact revenge after Spurs boss Mauricio Pochettino – the favourite to takeover at Old Trafford next summer – oversaw an eye-catching 3-0 win at Old Trafford in August. While it was Mourinho’s biggest ever home defeat as a manager, there appears to have been little lasting negative impact on those that played. 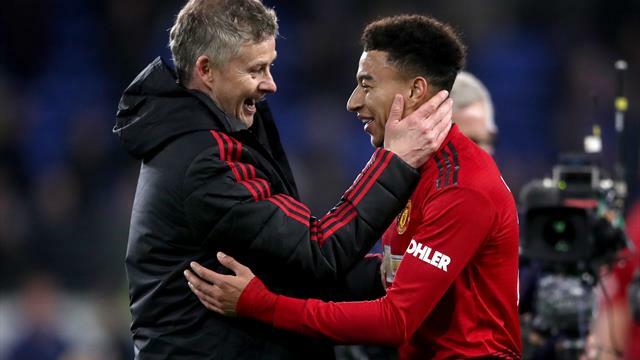 Lingard started that loss but the renewed positive emphasis under Solskjaer means entertainment is his main focus. He told MUTV: “It’ll be exciting. Obviously, as a Man United team, we’re there to entertain and get people off their seats, so that’s what we’ll be looking to do. Lingard will be hoping to continue his own fine form after a stop-start opening few months. The England attacking midfielder netted four times over the last five weeks and has fond memories of Wembley, where he has scored in the FA Cup, EFL Cup and Community Shield showpieces as well as shone for his country. “I think it’s very important,” Lingard said of his goal return. Paul Pogba is available for the clash against Spurs, having recovered from the leg issue that kept him out of last weekend’s FA Cup clash with Reading and missed the start of the trip to Dubai. Marcos Rojo has returned to his native Argentina as his injury is taking longer to heal than anticipated, while Chris Smalling is a doubt and Eric Bailly completes a three-match suspension.